Just have some faith in yourself and do what they say to do. You will most definitely not screw up checking and replacing bulbs. Adjusting the choke is easy too. you can post pics and write about your procedure and someone will be able to make sure you are correct. Just make sure you check and double check everything you do every step of the way and you'll be fine. If I recall you said the engine just cranks after you have driven it. If that is the case it could also be due to a bad coil. When a bad coil heats up it will not funtion properly. So you would not get proper spark and the engine will just crank till you kill the battery. I also already told you wht the issue is with the horn. Your Beetle was 6v now running 12v. Your horn and horn relay is 6v. So therein lies your issue. Just other things to check. And Mike is correct in saying we have helped out to the best of our abilities. I am crunched for time as far as working on vehicles.As in remove, rebuild, reinstall the transmission in my sisters Beetle, a MK4 Jetta TDI that I have been asked to work on ( and it's a paying job) I still have a Tyepe 2 to finish and not to mention the 58 Beetle that I haven't even started on So ya I have a full boat as far as projects. And I appreciate all that you guys have done. I have a huge fear in not trusting myself. this car means too much to me to break anything. As far as bulbs it isn't bulbs I know that. It is in the switch. I was just asking if I paid someone to help me work on it. As far as the horn goes It's not that we switched it to 12V. It never worked until I switched it to 12V. I also know the turn signal switch is broken, and not bulbs, and I know the head light switch is broken. I trust myself to change bulbs. Except the headlight bulbs. I'm not checking those. They are the original headlight lenses and I can't break those. I'd do a lot of it I just like the confidence that I don't like. This car has been in my family for 50 years and I do not want to break anything on it. Everything on this car except the engine is original. This is why I don't trust myself to work on it and I'd feel safer having someone do it for me. I'm not super mechanical but I'm also willing to work on stuff. Just not on this car by myself. I appreciate everything everyone Especially Mike and Wade have done. I don't know how to check the coil but I can find out how to do it. 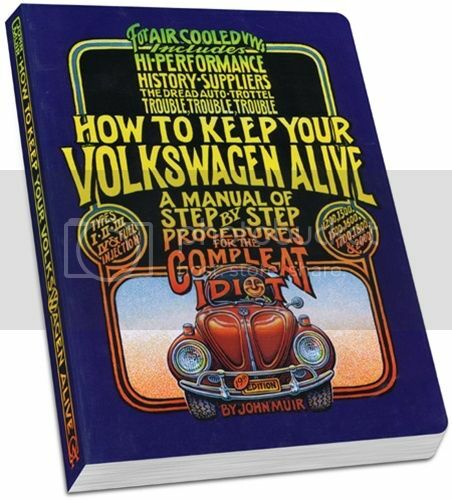 I have the original shop manual for it. As far as the battery goes I can jump it. The jump box has been in my Mercedes for the last few days and that has been in the shop getting worked on. Once I get back into VW I'm going to look into taking some classes that will teach me some mechanics and so I can learn to work on my own things. And I'll go back to owning multiple VWs again like I once did from 2001 to 2008. I never owned less then 4 at a time. Although unlike last time I won't do my own modifications. Yes they are I own three of them including an original copy with the spiral binding. and was actually looking through it tonight. I'll get this figured out. I'll keep everyone posted. Thanks for tje info wade. I appreciate the hwlp. And I do have another coil you could try out. How are you sure the turn and headlight switches are broken? They worked great last time we worked on it. You sure it's not just bulbs? I guess I'm not sure I'm going on what wade and I concluded. When you turn the lights on I have nothing but the indicator on the dash. And I haven't had turn signals for a year and the stock turns all the way in a 360 degree radius. I'll get some bulbs and check them. Wasn't there some bulbs we didn't repalce. I will not change the headlight bulbs because I can't get the lenses off and I do not want to break the glass. Still trying to get it started first. Wade maybe I'll try that coil.